Daily Illuminator: Ghosts Love Candy Is Shipping To Backers! 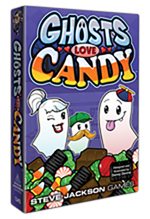 October 28, 2016: Ghosts Love Candy Is Shipping To Backers! We're very happy to announce that, as of today, Ghosts Love Candy is on the way to its Kickstarter backers! We've been working hard to get our printing to backers as soon as possible, and through a combined effort, it's finally happening. We hope that backers enjoy the game! And if you are a backer who has not given us your current shipping address, make sure you contact Al Griego with your Kickstarter username and address! If you like the look of this cute and spooky game, you'll be happy to hear that it will be coming to your friendly local game store in 2017! This early shipment is intended for backers, but we will have a larger, general release next year, in time for the Halloween season. To backers, enjoy haunting trick-or-treaters. For everyone else, we can't wait for you to check out this candy-grabbing good time. In the meantime, enjoy your real-life treats on Halloween!